We've been trying to align our new Ka-Sat dish for almost a week now. No matter what elevation or azimuth we choose (we want 40.5 and 171.8 ), or how carefully and slowly we move the dish, �the beep just doesn't change - just keeps on beeping away in the same tone/speed. �Arrgghh. Can anyone tell me what to do before I completely lose the will to live? Check that you have the cables not crossed over. Check that the F connectors are good. �The centre wire pin should be 1.5mm proud of the rim of the plug. �The pin should go into the hole and not push back when the plug is tightened. �The braid must make good connection with the�plug outer body. �There must be no fragments of foil or braid wire short circuiting the power supply. Use a magnifing glass if necessary. If you are in the Perpignan/Narbonne area try all of the beam types: 1, 2 and 3. An azimuth bearing of 171.8 deg is a little to the left of due south. The direction of the blue azimuth line (as visible in the Tooway dish pointing web page referred to above) relative to your house wall or garden fence may help. There's only one cable on the Tooway modem system from Sky DSL. We were told to attach it to the Tx connector on the TRIA which then manages both Rx and Tx. Brand new, well made cables. �Will check the pin length though. Have been using spot beam 3, will try the others. Yup, there is a sloping wedge shaped mounting box at back, but assume the scale on the elevation adjustment screw takes account of this?. We have been subtracting 9 degrees as our pole mount is off - elevating the dish by about 9 degrees. The blue azimuth line on the dish pointing page gave us 40.5/171.8 - Sky DSL (which no-one in France seems to like!) gave us 40.5/ 170.92 . . . �but said try +/- degrees up or down and either side. Will try again. If we don't succeed will call a local guy and hope he's familiar with the new Ka-Sat satellite! �We have been subtracting 9 degrees as our pole mount is off - elevating the dish by about 9 degrees. You're making things difficult for yourself with a mounting pole so far off vertical ... can you try and get it more vertical using packing washers or something like that? You'll then find the process much more manageable. With a 9 deg forward tilt on the pole and the need to aim the adjuster 9 deg higher, then since the maximum elevation of the adjuster is 45 deg you will never be able to point the beam high enough for your wanted 40.5 deg beam elevation. It won't work. �Attach the dish to a proper, exactly vertical, pole. Apply an inclinometer to the back of the wedge shaped box to get a good beam elevation reading. If the back of the wedge shaped box is vertical the beam elevation is zero, towards the horizon. Make sure you read the inclinometer scale the right way. Thanks! I have been following your guide BDS! It's much better and more detailed than what came with the system. Called in a professional installer yesterday to do the 'pointage' and even he couldn't get the TRIA to change its beep tone. So SkyDSL are sending a new TRIA. Hope that will do the job. Eric, the pole is sloping backwards (thus elevating the dish more), so we've been subtracting the 9 degrees not plussing them - hope that's right? But will try to get the pole more vertical. Am going to make an inclinometer this morning too and try that whilst we wait for the new TRIA. Thanks so much for all your support - it really helps! Eric, the pole is sloping backwards (thus elevating the dish more), so we've been subtracting the 9 degrees not plussing them - hope that's right? �But will try to get the pole more vertical. 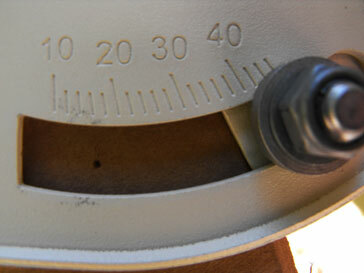 Am going to make an inclinometer this morning too and try that whilst we wait for the new TRIA. OK, you can point at the satellite with the pole tilted backwards. �It will be rather difficult to find the satellite however as the elevation angle will only be correct when aimed in the direction directly opposite to the sloping pole (assuming you have subtracted 9 deg). Any sideways movement will change the beam elevation angle and the azimuth angle simultaneously. Best to the get the pole upright. The back of the wedge shaped box will give you a true elevation angle measurement provided you hold the inclinometer is a vertical plane. With the back of the wedge shaped box vertical the beam elevation is zero. Tilt the back of the box backwards by 10 deg and the beam elevation goes up to 10 deg and so on. �You want 40.5 deg beam elevation. If you can see your house in http://www.satsig.net/tooway/satellite-dish-pointing-ka-sat-tooway-europe.htm then check out the direction of the blue line relative to the walls, fence etc. Thanks! I have been following your guide BDS! �It's much better and more detailed than what came with the system. Called in a professional installer yesterday to do the 'pointage' and even he couldn't get the TRIA to change its beep tone. �So SkyDSL are sending a new TRIA. Hope that will do the job. Follow the installation instruction of the Tooway KA-SAT Install Video step-by-step. Pointing is very easy because there is no KA satellite nearby (except Hotbird). Maybe a good idea to ask SkyDsl also for a spare modem. Send us a photo of the dish install. If you still have a problem alinging your dish after you have received a new ODU, you are welcome to visit our office in Begur and setup your system at our location (only 3 hours drive) so we can test it for you (free of charge). Please keep us updated ! Well, still alive - but only just. Thanks Eric and Europe-Satellite for replies. We finally got a new TRIA from SkyDSL on Monday. �And it beeps and changes tone! Yay, progress. However - it finds the signal OK (better on spot beam 2, though 3 appears better on your map), but then we can only get it to 12.4 DB and with no-one near the dish, no wind, perfect open sky, no impediment (we live on a high hill), it simply changes from the high tone and green tick circle there to the beep-beep tone and the little green tick circle on the coarse to fine pointing page on 192.168.100.1 disappears. �And the Rx SNR drops to 12.1 or so. then it sends itself back up to 12.4 and the tone changes and the green tick box comes back . . .
Are we wasting our time here? �Can we really get the 13DB min needed? �Already spent over 100 euros with professionals trying to point it (albeit with a duff TRIA first). Happy to have someone else come but not to waste more money if it's not going to work �. . . �getting fairly fed up with it . . . If you are at beam edge (perhaps at the intersection of the beam edges of three adjacent beams) then 12 dB sounds fine to me. Please say what are your lat/long coordinates and I will slightly move the satellite beam position on page http://www.satsig.net/tooway/satellite-dish-pointing-ka-sat-tooway-europe.htm to make beam type 2 better than type 3 for your location. Will post lat and long. Update. I left it to itself for 30 mins, then decided to try again. Plugged the cable back into my computer and it was online!!!! Not seeing the self activation page (on a diff tab), I stupidly, started the install again �Now it is hopping back and forth between syncing, scanning, ranging etc., but more importantly the cable attenuation is changing from nothing to max on the scale. �Is this important? �Cable problem? Feels like we're nearly there though! I'd leave it alone for while. It is worth recording, with date, on paper, what are the cable resistance, signal level etc for future reference, in case there is some gradual deterioration. Waggling the cable should have no effect at all on the service. �This is a test for bad cable connection. The dish mount should be rock solid. �Pushing gently on the dish in all directions should have no effect on the service either. A very small decrease in signal may be observed but this is of no consequence. �The signal will go down significantly during light rain but the servuce will continue operating. The service should only fail during the heaviest of rain storms. Poor F type connector workmanship is the main problem with in-service VSAT systems. �The centre wire pin length should be just proud of the rim of the plug (1.5mm) and must actually go smoothly into the hole in the socket and not "push back" as the plug is screwed in. � The braid wire and foil sheath are important and must make good contact with the plug outer. �There must be no fragments of braid wire or foil short circuiting the connection. �The plug should be firm finger tight - don't use brute force with a spanner and damage the internals of the BUC/LNB/MODEM. �The outdoor joint must be sealed from moisture. �Liberal use of electronic grade silicone grease and wrapping in self-amalgamating rubber tape helps. �Axial crimp F plugs, which exactly match the cable type, are recommended. Anyway, we tried a whole bunch of things, pinging the modem etc., then changed the Internet settings to only IP4 and not IP6, which apparently they don't use. And . . �we �now have Ka-Sat broadband!!! Thanks Umberto. �Yay. 11.8- 11.9 SNR right now but just done a Skype video call and worked flawlessly, phew! So �. . �we'll see if it's still working tomorrow! We're a tad south east of that but spot beam 2 is still the best. Thanks for all your help. �Will get those cable ends weather proofed - and might move the dish - it's exposed to the Tramontaine (Mistral) winds where it is . . .
Do get the cable ends weather proofed. Due to the DC power and sea air moisture I have seen a cable with the centre pin vanished (burned black) and the braid sheath turned to white powder for a distance of 6ft down inside the cable, all within 1 month of installation ! On page http://www.satsig.net/tooway/satellite-dish-pointing-ka-sat-tooway-europe.htm I have moved spot beam 15 (type 2) about 7 miles SE. �You are close the intersection of three beams and there is some uncertainty about levels in such areas. Don't worry, there is in reality significant operating overlap and you can work fine beyond the lines shown. Actual power levels vary from beam to beam and the beam pointings all drift around due to satellite movement, thermal effects and spacecraft attitude. It is not easy to aim the antennas at the earth with 0.015 deg precision! Can't get used to this speed �after years of 64kb ISDN . .
"Do get the cable ends weather proofed." On to it - we're close to the sea as well as the mountains . .
SkyDSL said the overlap between beams was such that it shouldn't be a problem and we had a SNR of over 13db yesterday, so it seems to be settling down. �I did notice a lost sync count of 7 - but we never seemed to actually go off-line. And that number hasn't gone up anymore. �12.8 SNR right now, so, given we're at beam end, not complaining. Thanks again for your and everyone's support. You've been life savers! do they tend to have good or bad attitudes? 1. If SkyDSL are advertising "unlimited download volume", please tell me exactly where you have seen this advertised. �I would like to check the exact wording and any qualifications. �I have a strict policy of avoiding association with companies whose advertising is misleading - particulary in regards to phrases like "dedicated" and "unlimited download volume" on what are shared services. I'm happy with the concept of shared "FAP free" services but people need to realise that their download amounts may be limited by congestion at times. I think the cheaper Tooway tariffs have a FAP policy applied with Mbyte limits per hour, 4 hour, week, 4 weeks. These are sliding time windows, recalculated every 5 minutes. 2. Regarding spacecraft attitude. �This refers to the direction that the satellite structure is aimed. Think of the satellite as an aircraft flying above the equator in an easterly direction. �The pitch axis (nose up /down) movement adjusts east west beam aiming errors. Roll axis (wings up/down) cause north-south adjustments. �Yaw axis (left-right steering/pointing) causes the beams to rotate around the sub satellite point (down below on the equator). Communications satellites with tiny spot beams need to have their beams aimed very accurately at places on the earth. �To do this the satellite antennas need to lock onto uplink tracking beacons mounted on the ground. Loss of attitude control causes loss of communications due to the beams no longer pointing at the earth and if the solar panels no longer face the sun the batteries will discharge. Immediate response is for the satellite to go into safe mode and try to recover lock on the sun, which is hopefully visible. �Having done that, the antennas can be gradually swung back towards the earth to reestablish normal communications. �The satellite has an omnidirectional antenna for telemetry, tracking and control (TT&C), so the spacecraft control centre can always receive technical data from the satellite sensors and transmit commands to the satellite to activate thrusters, adjust solar panel angles and switch and configure the communications payload. 1) "Do get the cable ends weather proofed." 1) Waterproof F connector caps. 2) Read the "small prints" and or GOS documents, SkyDSL / Tooway consumer packages are NOT UNLIMITED (you will find out soon), you have a hourly, daily, 4 hour, weekly and monthly limit. Avanti Hylas offers a real UNLIMITED service without FAP, anything you use above your monthly package will be charged extra every month without any limit (your bank account is the only limit*). Tooway (Skylogic) charge users according to how much they want or need to use their connections, so light or occasional users get a fairer deal than with some traditional broadband business models. To guarantee that all users experience equitable high speed Internet access, the Tooway� service has a policing feature to control excessive use and to enforce the subscription levels. They call this feature the Fair Access Policy (FAP). Excessive users become limited in speed at the moment they exceed a certain threshold of transferred data volume in any given time period. This feature has been built in to protect regular users' high quality connectivity from excessive use by just a few users customer. The volume limit depends on the service package the customer has subscribed to. If we didn't do this policing automatically, typically 80% of the available bandwidth on the network would be consumed by 20% of the customers. Here's how the FAP translates in what each account will give you in terms of priority access on a daily basis. Remember Tooway/Skylogic never cut you off. Some providers/resellers call this an UNLIMITED service. The Internet access will be provided without a transferred data volume based imitation of transmission speed. If no FAP is applied it is a free-for-all amongst all those sharing the same satellite capacity. �It can work well if no sites are greedy and if the number of sites put into the shared pool is limited by the operator. �Unfortunately, in the past, some people have had trouble with a few operators oversubscribing their services and the customers suffering severe congestion. �The problem is that satellite capacity is very expensive and the operators need a total income in excess of the cost of the satellite capacity. �On this web site we take a strong view regarding any misleading claims about shared services being described as dedicated or unlimited. A service described as "10000 UL" leads me to think "10 Mbit/s Unlimited". It is misleading to describe shared services as "Unlimited" �as you will be limited by the activities of others sharing the same satellite capacity. Really glad you got success in the end. It took me quite a while too. However since achieving success I must say the the quality of the solution is superb. I had issues for about 2 weeks but after that it settled down and the last 6 weeks or so have been issue free. I have dumped my phone landline and moved to "always on" SKYPE. * �95% reliable service compared with roughly 60% before. * �A satellite that does not disappear at the first sign of rain. * �A hugely faster (ten times) Internet speed on download. * I no longer have to pay SFR each month for a TV service they have never delivered. In some countries that might raise eyebrows but not here in France. The dish was difficult to install here as well. But, like you, we won in the end. I've been away for three weeks, so offline and unable to monitor our 'unlimited' package or downloads speeds. Even survived being off for three weeks, then having the cable disconnected and re-connected a few times (we still had it temporarily coming through the window until we were sure it was all working - now in its permanent place through a hole in the wall). What do you mean by "always on" SKYPE? We use Skype continuously for client consultations too, but I was thinking of investigating a VOIP add-on to get rid of France Telecom . . . However, I'm writing this in Notetab at the moment because today (we have very heavy and unending rain here - very unusual) the connection has gone down. So depending on it for the phone line exclusively might be a bit risky. There's always the mobile I guess. Anyway, just called SkyDSL - it is always a pleasant surprise when you don't get their answering machine - who told us that Skylogic in Turin are having a problem (also rain?) and the whole satellite is down. So we wait. Re FAP comments - my snazzy new Netgear router that we got to replace our old ISDN one has traffic monitoring on it (how reliable I don't know) and according to it, since we got back, on a day where we weren't at desks all day we used about 40mbytes download (computers were left on and browsers open). Yesterday with two of us, full on for average 10 hours apiece, emailing, web browsing including video watching we used 640 mbytes download and 105 mbytes upload (that surprises me, as it's mostly emails uploaded). Anyway, even with this - what we consider heavy - load (though we're yet to do a 90 minute webinar)that still seems to be well within the FAP limits posted by europe-satellite (thanks for that). I'm not convinced that we have a full 10mb download speed tho'. But can't check until we get back online. �It seems a little slower than when we were first up - but hey, anything faster than 64kb is a small miracle for us, so I'm not complaining - though I will to SkyDSL if it is less than what we're paying for. They were quite good at refunding fees during the time we couldn't get the equipment from them/couldn't get connected. Yes I agree Eric. But not many people, in France at least, seem to like SkyDSL, so hopefully for now, they're not oversubscribing . And their initial discounted offer of 19.90 per month up to Dec 2011 (albeit with an activation fee) has gone back to 49.90 per month with no activation fee, so I guess it might be seen as quite expensive for a normal residential user . . even for 10mb speed. Oops, just come back in and looks like we have lift off . .
Hi Gaia, when I install these dishes in North Wales even with the pole vertical I still have to set the dish at 40 degrees even though the true angle is about 25 degrees. If you are even further south you will need to set elevation even higher than that. If you are getting a tone from the dish it's more than likely the cable and connections are OK. So to recap the elevation setting on the dish needs to be approx 15 degrees higher than the true elevation. Hope this helps, good luck Kevin. Kevin in North Wales ... you must be using different Tooway dishes to those of us in France. The elevation angle marked on the dish is quite accurate ... have a look at the link below showing a close up of our Tooway dish elevation scale ... the calculated angle is 36.8 degrees and the actual angle on the dish is a smidge under 36 degrees. The dish is on a vertical patio mounted pole and the weight is pulling the pole just slightly out of vertical. Tooway satellite dish: setting the beam elevation angle using the scale. I've reduced that image from 2.1 Mbytes down to 16k bytes. Note that the reference mark is the edge of the white metal behind the slot, at present showing a setting of 36 deg beam elevation angle. Lost my thread for a moment, name seems to have been transmuted. Just an update on experience with SkyDSL. On the whole, it's been great - bar the (very) odd day when Turin is in its shroud and there are a few hours offline. We still have our trusty Numeris (ISDN) connection, so just plug that back in if its critical, otherwise we just go off and have fun. As to speed . . . hmmh. We pay for a 10000 UL contract, which is meant to be (up to) 10Kbps download. Having tested on several occasions we have had maximum around 6 or 7. And today, it's REALLY slow, for no apparent reason and can't get hold of SkyDSL CS so maybe everyone is calling them. The Internet access will be provided without a transferred data volume based limitation of transmission speed." transmission speed is not guaranteed. Duh?? Seems to somewhat confuse their clear no limit fair use policy statement! So, when I get to speak with them, I'll understand more of why it varies in download speed so much. Still, compared to ISDN, there is no debate, so I'm only quibbling . . . Finally got through to trusty Umberto - the seemingly sole SkyDSL technical support bod. So, Turin (Twooway) has a problem today and no indicated time of resolution. So nothing to be done about speed today. Re the general speed question - he confirmed no volume limitation on download speed. But did indicate that other customers had also complained about max speed and their billing people had adjusted their monthly fee. So I shall be pursuing that now. He did point out there was no guarantee on minimum speed . . .